Is China's Influence in Timor-Leste Rising? While there are indications of Beijing’s growing reach, its role needs to be kept in perspective. On September 13, the East Timorese government gave permission for its Ministry of Finance to begin the process of joining the Beijing-based Asian Infrastructure Investment Bank, a move that would strengthen growing relations between China and Timor-Leste. This came a month before the 5th Macau Forum Ministerial Conference took place, bringing together senior officials from China and all Portuguese-speaking countries, which includes Timor-Leste, in an effort to promote better relations and trade. Timor-Leste is Asia’s youngest nation and Southeast Asia’s poorest. First colonized by Portugal from 1701 until 1975, Indonesian forces landed on its shores just weeks after the Portuguese had left. They remained for another 24 years, during which time a third of the population is estimated to have died from execution, starvation, or disease. Independence was finally gained in 2002. Since independence, Timor-Leste’s two closest foreign partners have been Australia and Indonesia. However, relations with Australia have deteriorated in recent years, mainly over maritime borders in the Timor Sea, where there is an estimated $40 billion worth of oil and gas reserves. The case has been brought before the UN conciliation commission in The Hague. Last year, Timor-Leste also accused Australia of spying on its officials. During a talk on Radio Australia in 2014, Estanislau da Silva, Timor-Leste’s former deputy prime minister, announced: “We have neighbors, like Indonesia and Australia, but we also want to have a very close relationship with other continents, and particularly, China. China has been very, very supportive.” Indeed, China provided funds for Timor-Leste’s independence movement during the Indonesian occupation, unlike many Western governments, and supported the movement at the UN Security Council in the late 1970s, when many Western countries abstained on important votes until the later years. China was also the first county to establish diplomatic relations with independent Timor-Leste in 2002. In recent years, China has built office buildings for Timor-Leste’s Ministry of Foreign Affairs, Ministry of Defense, and the Timor-Leste Defense Force, as well as the Presidential Palace. More than one thousand East Timorese civil servants have visited China for training, while thousands of Chinese technicians have tutored their counterparts on the latest agricultural methods, urban planning, tourism, and so on. 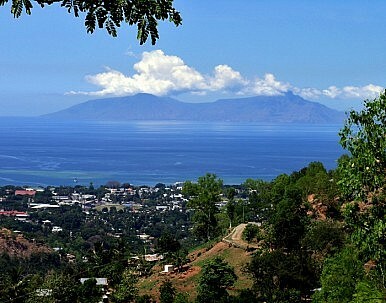 Economically, China means cheaper imports and potential exports for Timor-Leste. According to government statistics, in 2014, Timor-Leste spent $982 million on imports. Its exports, excluding petroleum, were worth just $91 million. This left a trade deficit of $891 million, a considerable sum given its GDP was just $1.37 billion that year. The majority of its imports still arrive from Indonesia and Singapore, but, in 2014, China became Timor-Leste’s third largest provider of goods, worth $41 million that year. Last year, when I was in Dili, the capital, I spoke to a businessman who sells agricultural machinery. “China is good. I can buy Chinese machines; the machines are good and cheaper,” he told me. A friend of his, another Dili businessman, he said, had recently returned from a visit to China and was ready to invest several hundred thousand dollars in Chinese-built solar panels. The following month, the Chinese navy paid its first visit to Timor-Leste when a task force docked in Dili’s port. Members of the Ministry of Defense and Security met with the Chinese commodore while the government held a ceremony to greet the arriving sailors. “It is not a show of force. It is displaying then strength of friendship between the countries,” then-Prime Minister Xanana Gusmao said at the time. Geopolitics in the Asia-Pacific region often invokes a 21st century domino theory, with fears of where Chinese influence will extend to next, and whether such influence will suffocate other, typically Western, nations. But for all the talk of friendship, Timor-Leste is unlikely to pocket a quick buck for its sovereignty, which it fought so heroically to achieve. Nor has it been unwilling to criticize China’s intentions in the South China Sea. On March 15, President Taur Matan Ruak issued a joint statement with Japanese Prime Minister Shinzo Abe, noting their “serious concern over the recent situation in the South China Sea,” and promised to oppose “any unilateral actions that could change the status quo and increase tensions.” It was the first statement by an East Timorese official on the issue. Clinton Fernandes, Professor of International and Political Studies at the University of New South Wales, told me after the event that it was an “own goal” for Ruak to stand next to the Japanese leader while he denounced China’s conduct. “China gently rebuked Timor-Leste,” he said, referring to a statement made the following day by China’s Foreign Ministry spokesperson Lu Kang, which did not specifically mention Timor-Leste. “Next time, [Timor-Leste] won’t get away with it so easily,” he added. At the time of the Indonesian invasion in 1975, there were an estimated 20,000 ethnic Chinese living in Timor-Leste, chiefly in the capital. But during the occupation many emigrated to Australia, the Philippines, or China. By 2002, only between 2,000 and 3,000 remained, although many have returned since. While many have assimilated, tensions remain between the local and Chinese communities. I spoke to an owner of a small hardware store in Dili, who, despite living in the capital for almost a decade, said he rarely mixes socially with the East Timorese and, instead, prefers to spend his time at the numerous Chinese community groups. In the small altitudinous town of Maubisse, high in the forest, about 70 kilometers from the capital, I spoke to a number of Chinese technicians working on local development projects. “I do not like this country,” said one. “I want to go home,” added his colleague, who dragged heavily on a Chinese-branded cigarette. An East Timorese acquaintance, who works in the development sector, said that except for eating at the local Chinese restaurants in Dili, he seldom talks to the ethnic Chinese, who keep themselves to themselves. He added that the East Timorese are often suspicious and sometimes believe the Chinese, particularly recent expatriates, are simply out to profiteer from Timor-Leste. “The relationship between China and Timor-Leste has been very beneficial to China,” Charles Scheiner, an analyst at La’o Hamutuk, an NGO based in Timor-Leste, told me. Despite ever greater levels of aid and investment flowing into Timor-Leste from China, it tends to swell when heading in the opposite direction. China has provided $77 million in aid to Timor-Leste since 2011, Scheiner said, quoting official statistics, but since 2009 the government has awarded Chinese companies construction contracts worth more than $525 million. Statistics from both Timor-Leste and China are often difficult to obtain, and frequently change depending on the source, but if the aforementioned statistics are anything to go by then for every dollar China invests in Timor-Leste its companies receive more than $6. Scheiner added: “It will be interesting to see if Chinese companies are still interested in a few years, after Timor-Leste’s oil reserves are depleted, and the investment and cash flow process inevitably becomes smaller.” In other words, when the money runs dry. A New Era of Political Coalitions in Timor-Leste? A look at the state of the country’s politics ahead of upcoming elections.